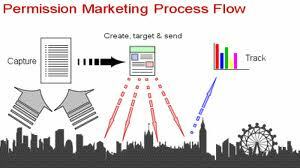 Permission marketing is a term popularized by Seth Godin used in marketing in general and e-marketing specifically. The undesirable opposite of permission marketing is interruption marketing. Marketers obtain permission before advancing to the next step in the purchasing process. For example, they ask permission to send email newsletters to prospective customers. It is mostly used by online marketers, notably email marketers and search marketers, as well as certain direct marketers who send a catalog in response to a request. This form of marketing requires that the prospective customer has either given explicit permission for the marketer to send their promotional message (like an email or catalog request) or implicit permission (like querying a search engine). This can be either via an online email opt-in form or by using search engines, which implies a request for information which can include that of a commercial nature. To illustrate, consider someone who searches for "buy shoes." Online shoe stores have searchers' permission to make an offer that solves their shoe problem. Marketers feel that this is a more efficient use of their resources because the offers are sent to people only if actually interested in the product. This is one technique used by marketers that have a personal marketing orientation. Marketers feel that marketing should be done on a one-to-one basis rather than using broad aggregated concepts like market segment or target market. In the United Kingdom, an opt-in is required for email marketing, under The Privacy and Electronic Communications (EC Directive) Regulations 2003 since 11 December 2003. Seth Godin sering disebut sebagai pemikir Pemasaran Masa Depan. Dia berada adalam satu Daftar 50 Orang Guru Masa Depan Pemasaran dari Chartered Institute of Marketing, United Kingdom bersama Philip Kotler dan Hermawan Kartajaya. Intinya Permission marketing, merupakan strategi marketing yang juga memperhatikan privasi orang lain, sehingga kita mengajukan permohonan kepada target, apakah ia mau menerima penawaran-penawaran selanjutnya atau tidak.